Sandwiched between oleaginous car workshops in a grimy back alley of grimy Lucky Gardens, against all odds Chef Low has managed to survive the curse of its predecessors. It’s the latest in a long list of doomed eateries to attempt a business in that specific address, but unlike the rest has garnered a following of regulars that attests to its status as one of the go-to destinations for reliably good, home-style Chinese food in KL. With all of its energy invested into the food and none whatsoever in the décor, Chef Low’s menu is – when you’ve taken in the pink tablecloths and plastic furniture – impressively ambitious. 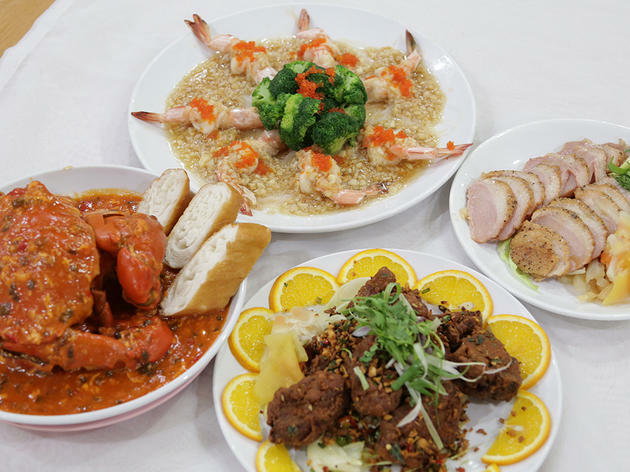 From seafood to poultry and medicinal foods to game, the plastic encased a la carte menu contains virtually every gastronomic staple that’s available in Chinese and seafood restaurants. Happily however, the jack-of-all-tradesmaster-of-none saying doesn’t apply here: At Chef Low’s, the food is consistently well prepared and infused with the confidence and verve of a cook who knows his trade well and isn’t afraid to show it. A signature dish is the Chinese-style fried bacon with marmite sauce, chilli padi and lime, which also happens to be a dangerous thing to order. Apart from the delightful dance it performs on the palate, the fried marmite bacon also proves two other things – the cooks at Chef Low a) love cooking with marmite and b) are very good at creating dishes that include marmite. To wit: marmite spare ribs which are crispy, chewy and rippling with flavour, and even the feisty, tasty crabs with marmite sauce. Apart from marmite, eggs also play a central role at Chef Low. 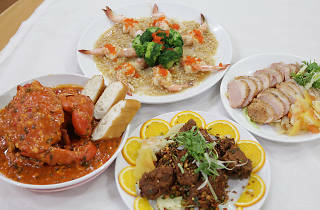 They’re used in soup (the salted egg yolk and century egg with spinach is a good example), seafood (try the mantis prawns with salted egg yolk), and vegetables dishes (the pumpkin fried with salted egg is a virtuoso interplay between sweet and salty), but nowhere are they employed to more devastating effect than in the steamed egg trio. Combining century eggs, salted egg yolks and plain chicken eggs, this dish isn’t just delicious, it’s also an efficaciously powerful memory jogger, and transports one back in one mouthful to childhood when steamed eggs with soya sauce were the ultimate comfort food. From the pedestrian nourishment of such ubiquitous dishes as the sweet and sour pork (Chef Low’s is one of the best in KL), fried glass noodles (aromatic and not too sticky) and kangkung belacan (al dente and not too heavy handed with their use of belacan) to the more exotic duck and yam stew and steamed scallops with beancurd and black bean paste, Chef Low can be depended upon to provide more than satisfying food on any given day of the week.